For a seamless kitchen, bath, or a large commercial project, solid surface materials are an excellent choice for any project. Solid Surface is stain, chemical, water, and bacteria resistant product, placing it as a highly trusted and commonly used material in excessively used areas such as in hospitals and restaurants. Even homeowners who desire a functional kitchen choose this product over others. Its smooth surface embrace a vast amount of inviting patterns, with many colors available in satin, matte, or high gloss finishes. Solid Surface offers a wide collection of color palette options so that finding a look and finish to compliment your design is made simple. Care of solid surface counter tops is also easy, and can be cleaned with warm soapy water or a standard household cleanser. California Crafted Marble has partnered with suppliers to offer you the most affordable options available. We offer brand names such as Hi-Macs, Livingstone, Corian, Hanex, Avonite, Samsung, Staron, and more! Solid surface integral sinks allow for ease of maintenance and are extremely durable and practical in residential and commercial applications. 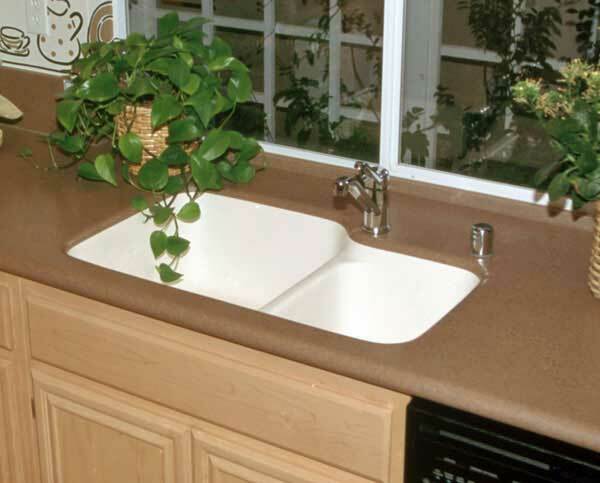 With integral sinks (sinks molded directly into the counter top), you will benefit by having an easier surface to clean, and not having to caulk and retouch an area after years of use. California Crafted Marble offers many sink shapes and styles. Custom colors and molds are available upon request. Thermoforming is a unique process where solid surface materials are heated up and and bent into a pliable desired shape. Solid surface backsplashes can be molded as an integral part of the counter top, eliminating the need for caulking and areas that are difficult to clean. Other options for thermoforming include upgraded edge details, and walls with curvature such as a tub skirt. Visit our Showroom in Santee, California!